Even Prince Harry is no match for this princess. On Tuesday, the royal stopped in Manchester, England, to pay a home visit to veteran Simon Flores and his children, Kobbi, Damaso and Lily-Anne. 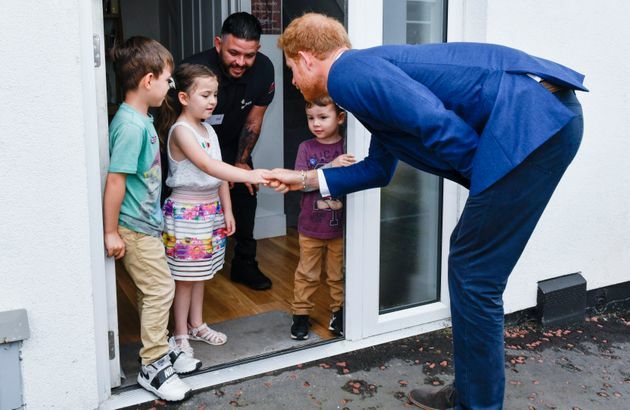 Prince Harry had previously visited the neighborhood two years ago as part of a home makeover program that featured houses of wounded veterans. But before he could look inside Lily-Anne's home, she stopped him. "Wipe your feet," she said, via HuffPost UK. The prince graciously obeyed and wiped his feet before replying, "Is that all? Shall I take my shoes off?" According to The Daily Mail, Lily-Anne's father said his daughter was the "the princess of the house" who always asks guests to wipe their feet. Just before meeting the family, Prince Harry was asked to comment on the recent royal baby announcement. "Fantastic, great, very, very happy for them," he said of his brother, Prince William, and sister-in-law, the Duchess of Cambridge. It seems Prince Harry might have a similarly big announcement on the way, according to a recent interview with his girlfriend, Meghan Markle. She opened up about the couple's relationship in Vanity Fair's October issue.